Yarn: The Fibre Company’s Canopy Light, from Purl Soho. Adam bought me this yarn for my birthday in 2009. It only took me five years to knit it. Needles: Body on a 5, sleeves on a 6, yoke on a 4. Project begun/ended: I think I started this maybe last February? Or maybe even before that? I’m not sure, but I kept adding length and it DOES fit Margot, even though it took me a year to make this. Notes: Would I ever blog again? Would I ever knit again? These are the questions a new mom asks. I have gotten into armchair knitting (i.e. putting stuff in my Ravelry queue in the middle of the night while dealing with Margot) and am hoping to get more into actual knitting again. A row every night will eventually add up to something, right?!? 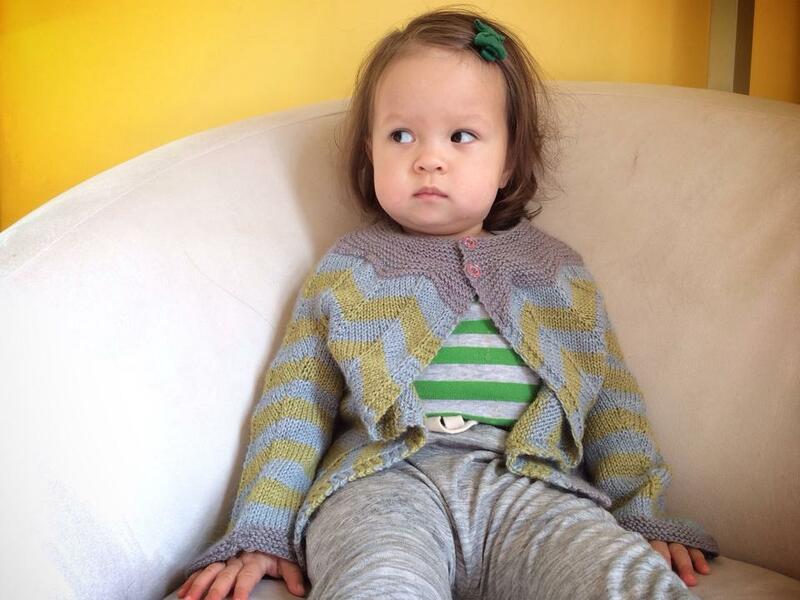 Posted in Baby, Finished Objects 2014, Sweaters, Uncategorized at February 8th, 2014.